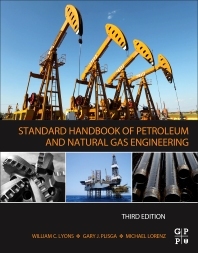 Standard Handbook of Petroleum and Natural Gas Engineering, Third Edition, provides you with the best, state-of-the-art coverage for every aspect of petroleum and natural gas engineering. With thousands of illustrations and 1,600 information-packed pages, this handbook is a handy and valuable reference. Written by dozens of leading industry experts and academics, the book provides the best, most comprehensive source of petroleum engineering information available. Now in an easy-to-use single volume format, this classic is one of the true "must haves" in any petroleum or natural gas engineer's library. A classic for over 65 years, this book is the most comprehensive source for the newest developments, advances, and procedures in the oil and gas industry. New to this edition are materials covering everything from drilling and production to the economics of the oil patch. Updated sections include: underbalanced drilling; integrated reservoir management; and environmental health and safety. The sections on natural gas have been updated with new sections on natural gas liquefaction processing, natural gas distribution, and transport. Additionally there are updated and new sections on offshore equipment and operations, subsea connection systems, production control systems, and subsea control systems. Standard Handbook of Petroleum and Natural Gas Engineering, Third Edition, is a one-stop training tool for any new petroleum engineer or veteran looking for a daily practical reference. Michael Lorenz is an experienced oil industry professional with 30+ years completions and workover experience. He has had the benefit of working in a wide variety of settings including both service companies and operators, and he specializes in reviewing reservoir conditions and providing optimal completion designs.